Krishna Kaur became one of Yogi Bhajan’s first students in the United States. These days her busy schedule includes being the 3HO regional coordinator for Africa and also running Y.O.G.A for Youth. Her work takes her all over the world, spreading the technology of Kundalini Yoga. Prior to this meeting, which was to have such a profound influence on the future direction of her life, Krishna had just returned from journey to Africa in search of her roots. She spent a year traveling around, sitting in villages, grounding herself into the culture, learning and being herself. In those early days there were no mantra cassettes or CDs – just Yogi Bhajan chanting the words, and Krishna would lean close and start singing along. He taught her well – she learned every detail and nuance about the pronunciations, rhythms, and other aspects of the mantras. In 1971 Krishna established and directed the Kundalini Yoga Center in South Central Los Angeles and maintained an active community outreach program for fifteen years. 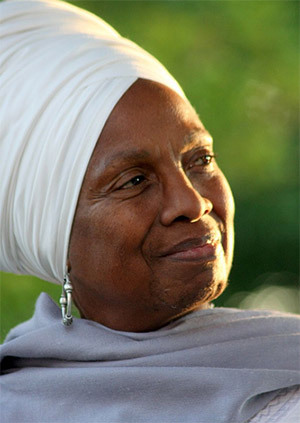 She went on to become the training coordinator for Kundalini Yoga in Africa, doing extensive ground breaking work in countries such as Ghana and Togo, and now teaches extensively throughout Europe, Central and South America and India as well as the US. Krishna Kaur has been singing all her life. In the 1970s she was a member of the Khalsa String Band, whose other members included Guru Singh, Singh Kaur, Sat Kartar and Gurudass. This band toured with Yogi Bhajan throughout the U.S. and Canada, during 1973-1974. In 2013, after all this time, she has finally gotten around to visiting a recording studio. She greatly enjoyed working with musical magician Thomas Barquee, who quickly vanquished her early fears, putting her at ease, and turning the whole process into a vastly enjoyable experience. The result is her new CD – One Creator. She doesn’t label her style in any particular way, other than describing it as the way in which her “heart wants to speak.” Her songs are infused with her travels, experiences, and her love of the divine. She is joined on the CD by C.C. White, who adds her own beautiful energy to the mix.